Lieutenant Colonel David Sterling is one of the legendary figures to arise from British operations in North Africa and his Special Air Service (SAS) forces were long noted for their long range operations. One of the iconic photos of those operations has him standing next to a patrol led by a Lieutenant McDonald in a modified Willys MB jeep. The first release of an SAS “Desert Raider” by DML’s cyber-hobby.com affiliate (Kit No. 6681) met with a lot of unhappy noises from Jeep fans as they made a number of errors with the chassis and wheels. This kit corrects most of those early errors but adds some oddities of its own to the mix. 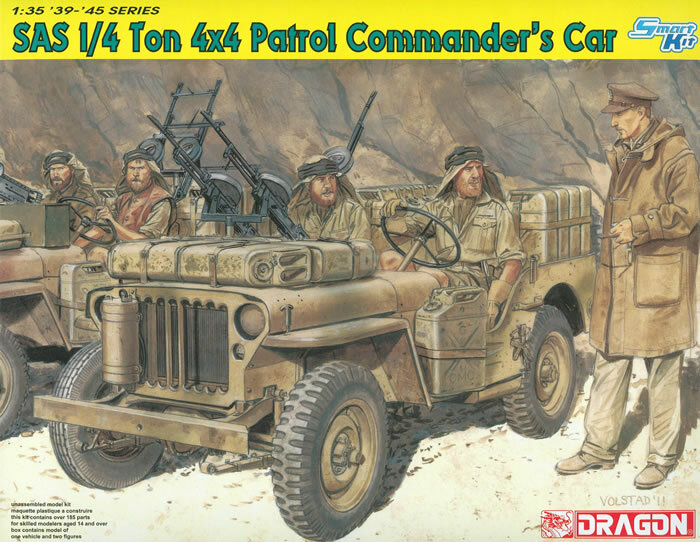 Note that once again because of the Chrysler Corporation demand for royalties for using the name “Jeep” this kit, like the Opel Blitz before it, does not state what it IS but just sort of what it DOES. As it has corrected parts as well as some nice new ones it now comes on four sprues – two different wheels and tires are offered - but the body and frame are removed from their sprues and bagged separately in the box. The body is slide molded with all but the grille and rear plate. There are some serious injection pin marks on the bottom of the body and under the fenders, but other than the fender wells I don’t think most modelers will bother with removing them. The frame is also one piece with all braces and the rear “bumperettes” molded in place. A so-so tow hook is also molded in place on the frame, but as the opening section of the military hitch is provided (part B45) as a separate part it will probably look better when assembled. The model comes with a cut-out grille but then emphasizes a new correct molded full grille which comes with the new set of universal tires. The Mark IA eyeball tells me they are virtually identical other than the missing bars, so apparently DML has corrected the original grille with incorrect spacing and location of the blackout lights. For some odd reason the model comes with both an improved set of universal (combat) tires and wheels and a set of “street” tires built up from five sections, two tread sections attached to either side of a central disk section. This is odd as all of the photos I can find of the SAS modified jeeps show them with normal 7.00 x 16 universal tires on them. Be that as it may, they are in the box. This kit comes with four German “jerry” cans and 16 new mold US models. Each of these has a separate body and top section, handle, and choice of screw (fuel) or flip-up (water) lids. Etched brass tie-down straps are included for all of these cans to attach them to the vehicle. Five go on the hood, four on each side in the passenger compartment. Two spare tires and two etched brass sand channels go on the rear of the jeep. This vehicle has a far more normal armament of twin Vickers K guns forward and a third on a rearward facing mount behind the passenger seat. All are slide molded with hollow bores and come with four magazines for the K guns (with etched brass handles). The seats have separate pads and backs, and the controls are very complete, to include pedals and a sun compass (part B18). The figures are basically the same torso and legs with new heads and arms to differentiate the driver and the passenger. Even though it is hard to see the passenger’s details, Lieutenant McDonald seems well represented, burnoose and all. Ron Volstad’s faithful copy of the iconic photo provides the best color and finishing options for these figures. There are three finishing options: all three are for the SAS in North Africa and vary from sand with grey, sand with green, or all sand. There is no information if any of them used the street type tires and wheels. A tiny sheet of Cartograf decals are included for the instruments and “Water” stencils on the suitable cans. Overall this is a good improvement over the first kit and more likely to be popular.